If you’re a Halloween traditionalist, then you’d better look away now. Our evening of Halloween activities on Wednesday was traditional in some ways: we were all dressed up, (my Lovely Husband and I included), the girls had baskets to collect candy (sweets) in and we even went to two Halloween parties before we went out trick or treating. Before I tell you any more, I need to tell you a little of what trick or treating is like back in the UK. Normally we would get the girls dressed up as witches and then visit 3 or 4 houses in our street (pre-arranged) where we knew people would be in and be happy to participate in the Halloween festivities. We might get a few children ring the doorbell for trick or treating once we were back home, but again it was mainly children we knew. It’s also cold in November at home. This is an important fact to remember. Halloween here is a massive excuse for anyone to dress up, as anything they like. However, the heat on Wednesday night was warm even for Houston: 28c at 7.30pm at night. We all sweltered. I’d dressed as a witch, including tights, but I disposed of these (in a most unladylike fashion) in the car before we even got into the party! The girls were hot and thirsty before we’d got to house number 5. But the most major difference is that a lot of the trick or treating was conducted via golf cart! (I told you Halloween traditionalists wouldn’t like it…) The parents sat on the golf carts whilst the kids ran from house to house. 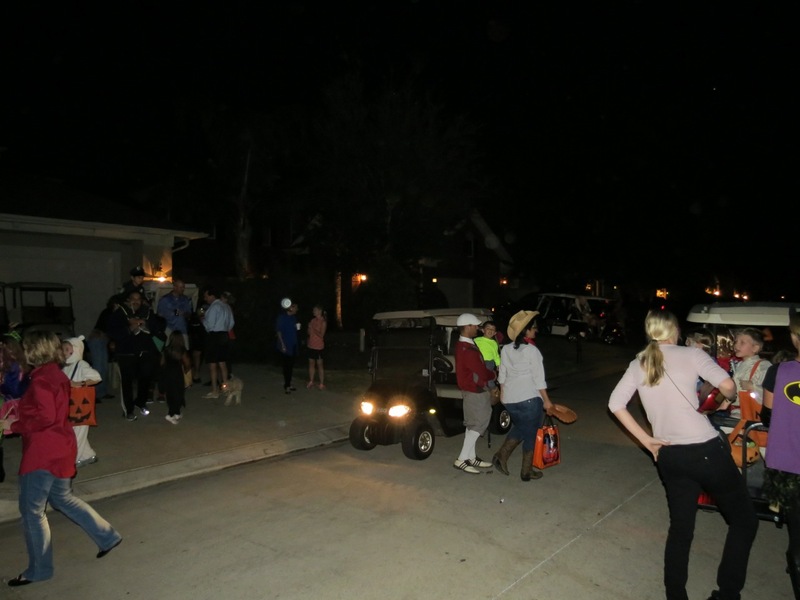 The parents had alcohol supplies on their golf carts and the children would go to a few houses, then empty their candy bags in the golf cart before heading to the next house. At several points there were golf cart traffic jams! And there were hundreds of children. We walked maybe half a mile along a local street and at every door there were 10-15 children trick or treating (and not the same ones either as our two were very slow in comparison to the marauding hordes of children running and skipping across people’s lawns to get to the next house first). Some people had set up tables on their driveways to give out candy and lots of people were having small parties on their drives with friends, watching the children. Some families were giving out double handfuls of sweets to children and the girls have enough candy to keep them going until Christmas, if not longer.